You’ve seen the skichair, now get the wine rack! Skichair founder Mike also makes these wine holders out of recycled skis and boards. It’s that time of year where we try to find special gifts for special folks. There are also some truly different ways to make someone happy by providing creature comforts and/or a memorable experience. Here are a few suggestions, which might peek your inner creative genius for a gift. 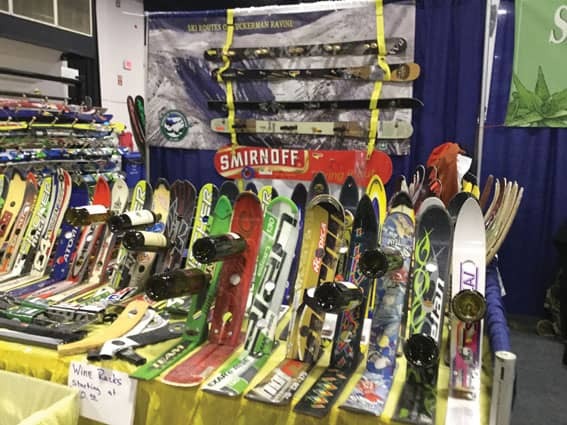 For the ski house or anyone who likes wine or wants to memorialize old skis/boards? Here’s a different wine rack made from recycled skis — you can even ship your boards to Mike for a custom wine rack. “Board” racks with pegs and ski chairs aren’t new, but they are different if you have just the place! (Skichair.com). Skis or snowboard made in the US? If you want made in America, you can find many brands at a range of price points. Meier skis, which are made in Colorado has introduced a new Eastern ski and Stick Poles (bamboo poles). Powe snowboards hail from Vermont, Yopp are made in Maine, and Parlor skis in Massachusetts — the guys started making them in the basement of a building that was a former funeral parlor and hence the name! Check out the Ski the East limited edition of 100 pair of J Skis. Jason Levinthal (founder of Line skis) collaborated with Chris and Geoff at Ski the East. They design skis in Vermont and build them in Quebec (skis.com/products/skitheeast). Want to keep digits warm? How about socks with a lifetime guarantee not to wear out? I wear my Darn Tough merino wool (made by Cabot in Vermont) ski socks for skiing, hiking, snowshoeing, cross-country skiing, and stacking firewood. Warm, don’t itch, and no holes yet! For hands that freeze, look into the latest glove technology with linings that help retain body heat along with Gore-Tex for waterproof, breathable protection and even touchscreen fingers! There are many good ski glove brands. Seirus Heat Touch Gloves provide the ultimate (like boot heaters and are pricey but do the trick). Mitts are good for keeping fingers together and heating each other so consider them (can be worn with liners, too), also. Check out 180s Exhale heat system gloves (with fleece liner). You blow warm air into them when fingertips get cold — I’ve had mine since 2005 and they work for me. Want an environmentally sound way to keep warm? Try merino wool or alpaca for base and mid layers. The sweaters are as beautiful as they are warm. Although wool sweaters don’t wash as easily as fleece (toss in machine ease), they may be making a comeback as we learn more about environmental concerns with washing fleece! This regards micro plastics getting into our water supply and oceans (www.mountainonline.com/the-fleece-police). Want free equipment for a first-timer and best gift ever? Killington’s Elan 4-Day Discovery program, innovated at the big K for the 12/13 season, set the bar for the entire ski industry (they even shared their info and results so now other areas also offer a program modeled after Killington’s). They’ve expanded to children’s and Burton programs, too. Killington’s Adult (age 18+) Discovery programs ($349) feature any 4 days of lessons, rentals, and lifts with the participant getting their own brand new pair of Elan skis or Burton snowboard, both with bindings, for free at the beginning of the fourth lesson. Perks follow with lift ticket and other discounts. (Limited sets of ski sizes so gift someone the package asap). Killington is the only area to offer a Burton LTR Discovery program, and the program has already sold out of the largest size snowboards for heights 5’8 and over. There was availability of 145 cm for heights 5’3” and under and 150 cm for heights 5’4’to 5’7” at press time. There’s a children Elan Discovery program ($399) for any four days (do not have to be consecutive). Skis come in three youth sizes with suggested 90cm (for child 40-45” tall), 100cm (46-50”), and 110cm (51-56” tall). The program is ski-fit dependent and probably appropriate for ages 4 to 9 depending on a child’s height. Learn more at killington.com/discovery or (800) 923-9444. Want to gift lessons with a legend? Here’s a great and different gift for anyone of intermediate or advanced ability who wants to augment their skills with two of the finest, most awesome skiers in the world! Donna Weinbrecht may be the first Olympic gold medalist in moguls, but that doesn’t mean she’s out of your league. Check out her March and April mogul camps at killington.com/site/lessons/adult_programs/moguls. One of the world’s top adventure skiers and another marvelous teacher, Dan Egan gives All–Terrain clinic in January and Explore the Beast clinics in Feb. and March (killington.com/site/lessons/adult_programs/explore_the_beast). Need a unique Big Air gift?